The beer-cans keyboard is an interesting idea, but let’s face it, a device like this probably wouldn’t stay intact for very long. On a belting hot day, people would be grabbing the letters before you’d even had a chance to finish bashing out your first sentence. 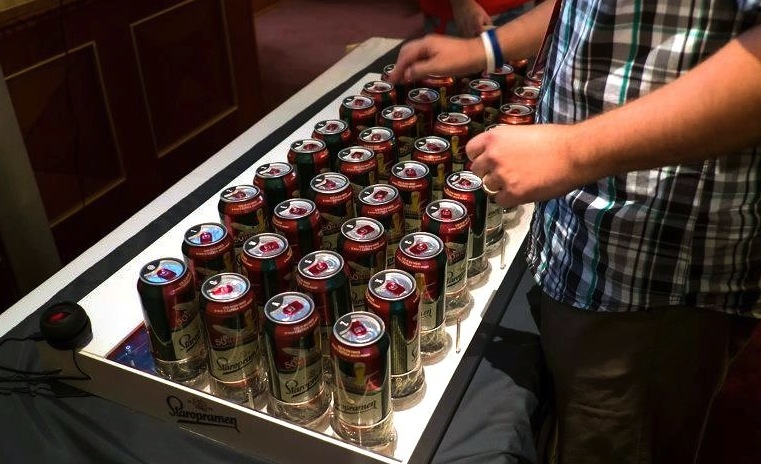 The beer keyboard, comprising an Arduino single-board microcontroller, a Raspberry Pi mini-computer and lots of cans of Staropramen beer, was introduced to the drinking masses at the recent Webstock conference in Romania – an event sponsored by, you can probably guess, Prague-based brewery Staropramen. It’s a simple concept and one highly unlikely to turn up at your local electronics store anytime soon. Forty cans make up the novel QWERTY keyboard. As you might expect with a keyboard, the user simply has to gently press a can/key and the corresponding letter will show up on a connected display thanks to the magic worked by the Arduino board and Raspberry Pi computer. At the Webstock conference, attendees used the keyboard to input their email address to enter a competition. No doubt it’d be rather tiring trying to use a keyboard like this – not because it’s so big, but because you’d be constantly shouting at friends or family members to “gimme back the A” or whichever letter it was that was removed and guzzled when you weren’t looking. The group behind the keyboard – a bunch of techies who go by the name Robofun Create – says it can be plugged into any laptop or computer, though for most people it’d probably be better off cooling down in the refrigerator. On its website the group says it makes “the kind of technology you cannot buy in shops” and is also responsible for the creation of a beer piano and a laser harp, among other things. Check out the video below to see the bizarre beer-cans keyboard in action. Delivery of cheapest Surface slips to three weeks, Touch Cover rejected by consumers?